When getting custom cardboard cylinder boxes packaging for food packaging, each year there comes a lot of new packaging styles- they are no longer limited to some common or outdated styles. If you want to customize a large tea box packaging to enhance the recognization of tea brands, and make the sales business carried out more smoothly, you need to get a customization of unique product packaging, the packaging does not only give a promotional effect, but also, to a large extent, enhances the added value of tea, making profits and sales higher. Most of the cardboard tube packaging is based on cardboard as raw material, single paper as the surface paper, and just keep this line of thinking. However, this Pu’er tea packaging has broken the conventional boundaries of the past, the use of fine paper as tissue paper, and directly on fine paper prints carefully designed patterns, getting itself very unconventional. Thin lines, whether according to the visual sense, or from the touching feel, give a very strong sense of lines. What’s more, the patterns and words are printed directly on the paper, with very strong three-dimensional sense, the effect achieved is better than the hot stamping process. At the same time, due to the reasons of packaging background color, in order to play a better role in the backing, it uses a black plastic cover on the cylinder structure. Custom printed tea packaging gives people a sense of simplicity. When customizing cardboard cylinder boxes as packaging for large tea boxes, its packaging design style is mainly based on tea varieties and brand positioning. 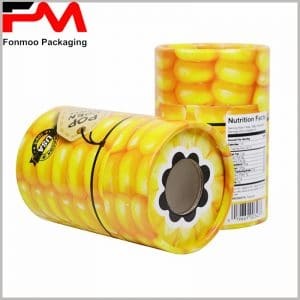 As a professional tube food packaging manufacturer, we have a good grasp on every detail of round box production and can provide you with many customized packaging.